The Dances of Universal Peace provide a joyful, multi-cultural way to touch the spiritual essence within ourselves and others. Being inspired by the wisdom and sacred phrases of the many spiritual traditions of humankind, they are essentially a form of celebration and meditation in sound and movement. There are no performers or audience, new arrivals and old hands form the circle together. The Dances are easy to learn, and everything you need to know for each Dance is taught first. Even though you might feel unable to sing ‘in tune’, or feel you have ‘two left feet’, these Dances are welcoming to all. They can be great fun as well as most profound. 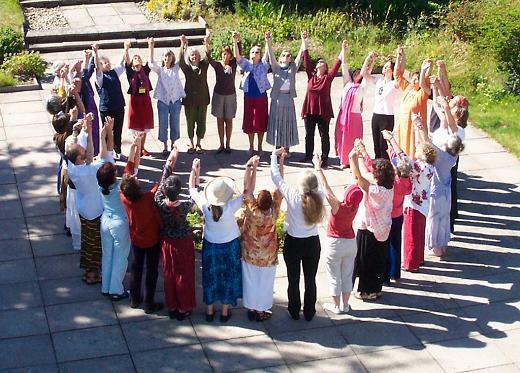 The Dances of Universal Peace offer a safe way to be open to other people, creating trust and healing on a deep level. Through this dancing we come to know more of our true selves, so bringing peace, joy and unity to ourselves and to others. Murshid Samuel Lewis also taught Walking Meditations using an attunement to various centers, elements, planets, sacred phrases and masters, saints and prophets. These Walks are an indispensable foundation to carrying the energy of a Dance appropriately and with maximum attunement. A study of the Walks includes learning to focus on the specific quality by using attunement to breath and sacred sounds to deepen the bodily experience. Each person’s experience of a body-centered walk will vary.